I'm with you on that. Me too. Robert gave one of my favorite presentations at Reboot. Slides here. One of the things he talked about was what could be learned from the organization of Roman legions. An organizational structure that worked very well for a great many years. This core organization is about 5,000 people. It has inside of it, all the capability to do any work. These core units were part of a larger organization of about 150,000. It had a junior but related organization making up another 150,000. The total network was about 300,000 people. There was a small secretariat that was responsible for the entire larger unit. This secretariat had one major focus, talent spotting and talent building. More on that a bit later. The design for the core organization took about 400 years to reach peak. It evolved like a fishing boat evolves in a region: as a result of trial and error until the optimal design settled. After reaching optimum, this design remained relatively stable for nearly 400 years. Key elements of the design are still found in organizations that require peak performance today 1,500 years later suggesting that these design principles are natural and not invented. Unlike our fantasy design today, this was not a CEO or head office dependent organization. It was designed to be brilliant with ordinary people who were put inside an extraordinary design for a society. It was the social design that made it so high performing. Senior leadership was designed to be transient. The CEO of this 5,000 person core organization changed every 3- 5 years. He had a head office administrative staff of 6. The Staff Executives usually only stayed for 6 months!. The CEO usually had held one of the staff jobs earlier in their career. The CEO relied on 2 senior middle managers at head office for all the important operational decisions that he had to make. They had at least 40 years experience each and would be the best of the best in the larger organization of 150,000. Their posting lasted for one year. So this was a 5,000 person organization with almost no head office! All the the head office jobs are temporary including the CEO's. No dependency on star CEO's here. The base organizational work unit has 80 people in it. Depending on the task of the time, these were sometimes doubled up into a work group with 160 people. When a big job had to be done, 6 of the base groups would be assembled into a work group of about 480 people. This 480 person grouping was ideal for complex work of all types. Such a group could also be separated from the main body by thousands of miles and by years and still hold its cohesion. So, apprently the numbers end up forming something similar to a Fibonacci sequence, representing some numbers that just naturally work well, and that add up in a certain way. This organization is in reality a network of social building blocks of 1 - 2 - 8 - 80 - 160 - 480 - 5,000 - 150,000. The hubs of this network where all the nodes intersect is in the 80 unit molecule. Every unit of 80 has a Hub Connector. Yes a span of control of 80! This works smoothly and routinely because of the social structure inside the 80 of 1 - 2 - 8. The world of the 8 is the "Trusted Space" that is designed into the organization. At every level after that a Hub Connector is either in charge or has the major say operationally. The Hub Connector is the link at every point including the larger world of 150,000. The Hub Connector is not tied to the 5,000 person organization but serves inside the entire system. The point is that there are certain sizes of groups that work better than others. There are limits to how many people one can have a relation to at the same time. Like the 150 of Dunbar's Number. There are other key factors than the numbers, of course. 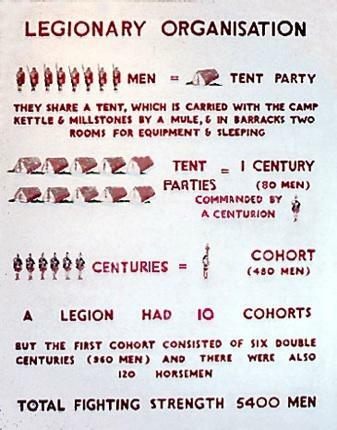 Factors that make people very close, like living in the same tent with the same group for 20 years. And how the leaders are selected. I wouldn't have thought of Roman legions as being an example of natural organization. But it makes sense that when one evolves organizations that work very well, one is likely to have stumbled upon some principles of nature that just work. Other stories tagged as "reboot9"